And not just for fundraising! At the age of 19, Shavez Cheema started an organization that helps schoolchildren understand the unique nature of wildlife in Brunei, the importance of conservation, and how to identify when a wild animal needs rescue. So far his organization has rescued 82 animals and hosted 78 school workshops for hundreds of children. At the age of 24, Olya Esipova is one of the world’s experts in Saiga conservation. Speaking at the Wildlife Conservation Network Expo on the plight of the species and how to save them, she reminded us that it is up to us whether we want to save wildlife or destroy it. 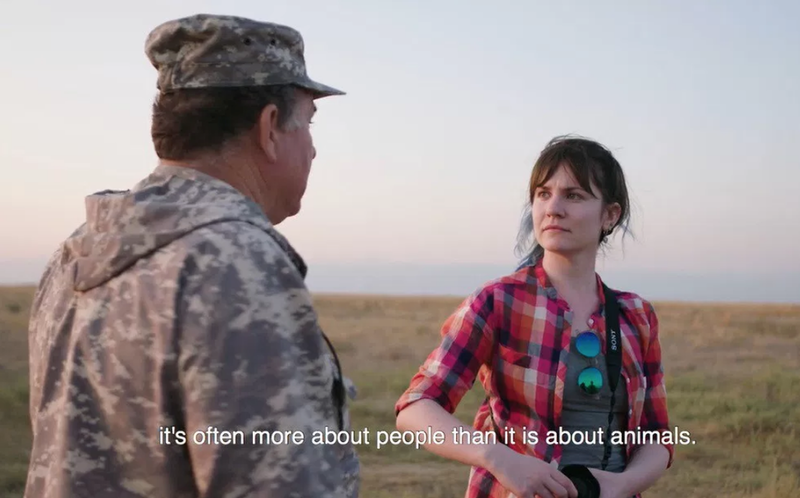 olya esipova featured in a film by nautilus magazine about the challenges of saiga conservation. SHAVEZ CHEEMA HANDLING A PANGOLIN, WHICH IS NATIVE TO BRUNEI AND aN IUCN Red List crITICALLY eNDANGERED SPECIES. Both Shavez and Olya are part of Youth for Wildlife Conservation, an organization run entirely by individuals aged 18 to 30, creating a global network to empower and engage early-career conservationists. In addition to their passion for wildlife, these hard-working, compassionate, inspiring individuals all have something in common: they are Millennials. The same generation that has been widely labeled as being a “problem” in the workplace, and the “most entitled and self-absorbed generation in human history”, is making waves in the conservation and nonprofit sector, and they are only just beginning to enter the workforce. So what gives? Are Millennials really just a burden for nonprofits to bear, or do we need to step back and better understand how to best engage and leverage the talents of this generation that will inevitably become the lifeblood of our organizations, and the future of conservation and animal welfare. Millennials are impact-oriented - They seek fulfillment in the workplace, and generally place a higher value on the social impact of their work than previous generations. In fact, Net Impact found that a majority of young employees expect to have some kind of impact within 5 years of their employment. When Millennials’ jobs enable them to make a difference, they exhibit higher levels of loyalty to their employer, and feel empowered by the ability to make a difference. They want workplace flexibility - The internet age has unleashed a technology revolution, and the possibilities for a generation raised with access to these resources has led to an explosion of options enabling telecommuting and flexible work hours. Millennials believe that flexibility makes them more productive, and they are savvy about the technologies that allow them to work in varied places, times, and conditions. They don’t necessarily stick to one job - Millennials have brought us the age of the “job-hopper”; the average tenure in a given job has decreased dramatically since the 1980s, with markedly fewer people staying in their jobs for longer terms. As the social, economic, and political parameters that once defined career decisions have begun to shift, so too has the strategy for maintaining satisfactory employment, particularly for Millennials. Simply put, the Millennial generation is much more likely to leave their jobs to seek better paid positions, opportunities to ladder-climb, and even greater flexibility or benefits. Not only are Millennials our current and future workforce, they possess tremendous power to affect change both inside and outside of our organizations. When we think about making organizations work for Millennials, we are often making it work better for all staff from all generations. Make impact matter – Millennials are particularly motivated by the potential to have a positive social impact and typically want more meaning in their work. These characteristics are shared across generations so creating an impact-focused environment will actually reap benefits for all workers. In fact, when respondents of different age groups were asked whether it was more important to be successful personally, or to make a difference for others, Baby Boomers and GenXers chose making a difference for others to a higher degree than younger age groups did. This should matter to your nonprofit because highly engaged employees – whether Millennials, Baby Boomers, or GenXers – means higher productivity and all around healthier organizations. One powerful way to engage staff is by authentically connecting their work to impact. Create flexibility in how, where, and when staff work – Millennials want flexibility. Offering remote working options can increase productivity, reduce stress and improve work-life balance. It can also save an organization on overhead costs, increase flexibility, and widen the applicant pool. When structured deliberately, remote-based workspace can actually be a forum to encourage company culture. In-person meetings with employees who don’t see each other on a daily basis can be even more engaging and intensive, allowing stronger bonds to be built between teammates. Even allowing employees to work from home just one day per week can have myriad benefits, including improved satisfaction and morale, reduced stress and burnout, and even boosted attendance rates. If you are thinking about creating more flexibility to make Millennials happy, chances are you’re going to make everyone a lot happier too. Develop a leadership pipeline - The impending retirement of senior leaders is not a new phenomenon; but it now has a heightened importance for every organization. Seamless leadership transitions rely heavily on a solid leadership pipeline, and if Millennials are hopping from one job to the next, you may find yourself quickly losing talent and exhausting resources to build it back up again. Creating intention in how you cultivate leaders within your organization will mean that Millennials will hop “up” your institutional ladder, rather than off it. Try some of these tips, such as creating a Development Action Plan, to cultivate leaders internally and build a pipeline for your talented workforce. A lot of organizations are also seeing the benefits of creating internal professional development programs, which can lead to improved job satisfaction as well as better retention rates. Millennials will soon make up a massive percentage of the labor force, and there is no denying that this new workforce is reshaping the job industry. It is becoming ever more critical to start taking a hard look at where Millennials fit into the workplace, or perhaps more importantly, how your organization can make jobs more attractive for this growing generation of workers. Hiring and retaining inspiring, talented change-makers like Olya and Shavez may just be the reward for your efforts. Find out more about IBD and how we support nonprofit organizations, or feel free to contact us with questions or for more information.